Are you feeling festive already? Christmas is coming soon and I'm all into finding the perfect gifts for everyone. It's been fun so far but I hope to be done before the Christmas madness hits me. 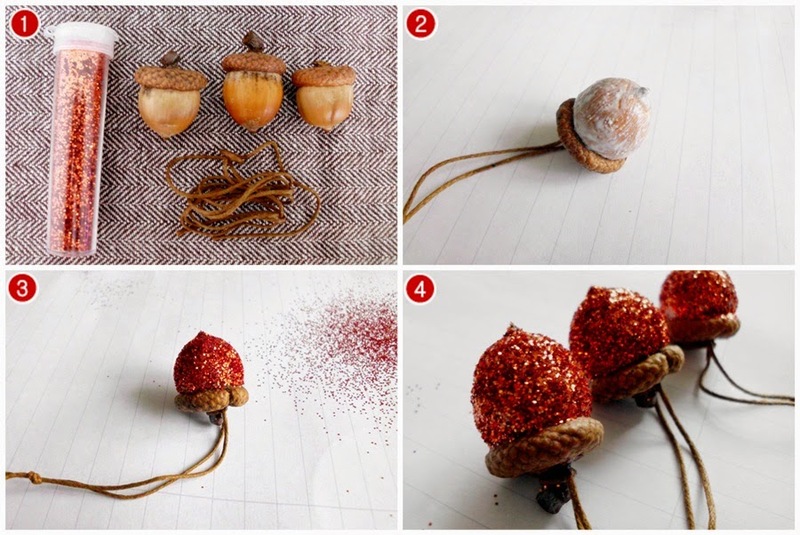 You'll need some acorns (with cap), some glue, a small paint brush, scissors, thread or a ribbon for the hanging, glitter! Before you start, clean the acorns. Tie the ribbon to the small stem on the acorn cap. I did a simple knot around it and secured it with a little blob of glue. Make sure your glue is transparent after hardening. After the hanging is nice and secure put some glue on the acorn (but leave out the cap) and spread it thoroughly. Use a paint brush if needed. 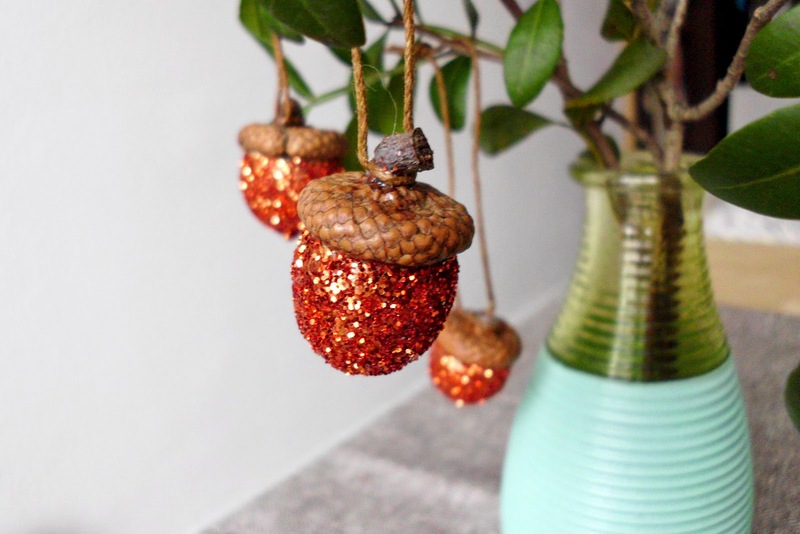 Sprinkle the acorn with lots and lots of glitter. This is the fun part! Sprinkle until everything is nicely covered in glitter. Give the acorn a little shove or two to remove excess glitter. Looking glittery over here! Let the glue dry and your glitter acorn ornaments are ready to be used! 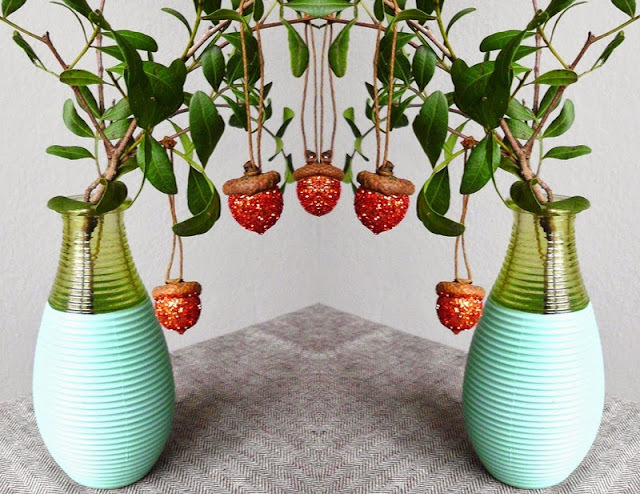 These ornaments are perfect for autumn and Christmas as well. And ... glitter. GLITTER! I know the first glitter-themed post was more than overdue. I love the festive look of these ornaments and I will definitely make some more for Christmas decorations. If I can find some more acorns with caps, that is. Great job and I especially love how you displayed them! Word of warning. Some acorns have worms in them. Even if you look for hole free acorns..they may have critters. I sealed mine in a plastic shoe box until I was sure they were all dead. You get really sticky acorns that way. What a awesome ornament.I love make DIY ornaments to decorate my house on Christmas. That's so cool I have never seen. As always, I'll make glass beads jewelry as gift for my friends.